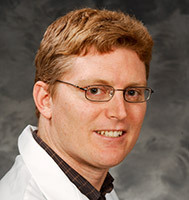 As an oncologist, Dr. Michael (Eli) Eastman treats all forms of cancer. He joined the faculty of the University of Wisconsin Carbone Cancer Center in August 2000. From August 2000 to October 2005, he served as medical oncologist with the Leonard C. Ferguson Cancer Center in Freeport, Illinois - a regional affiliate of the UW Carbone Cancer Center. In October 2005, he was named medical director and medical oncologist of UW Cancer Center Johnson Creek - a collaboration among UW Health, Watertown Area Health Services and Fort HealthCare. This collaboration enables patients to receive treatment close to home while benefiting from the latest research at the UW Carbone Cancer Center.